Recently I was looking into balloons, toaster-pops, and general system tray messages. There's nothing much WPF gives you out of the box to give you a leg up. So I turned to Google to search for either code samples or control libraries. I found a fantastic free open-source all-in-one framework for all things balloons, system-tray and toaster-pops. So it looks cool, but how hard is it to make a quick and dirty sample application that shows a custom balloon pop-up out of the system tray? (and yes it follows the tray if you move your task bar). 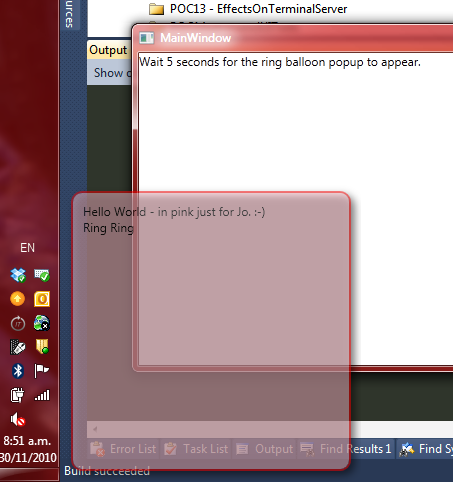 Create a new WPF project and reference the one Hardcodet.Wpf.TaskbarNotification DLL. Add a user control to define what you want your custom pop-up to look like. Its so little code, given a few days of my cat walking randomly across my keyboard, there's a good chance he will come up with this code on his own. Better chances of winning the lottery over the holiday break any way!